Hazardous waste | Vydrus s.r.o. Since 1992 the VYDRUS Ltd is organizing buy-up and collection of lead and nickel-cadmium batteries. 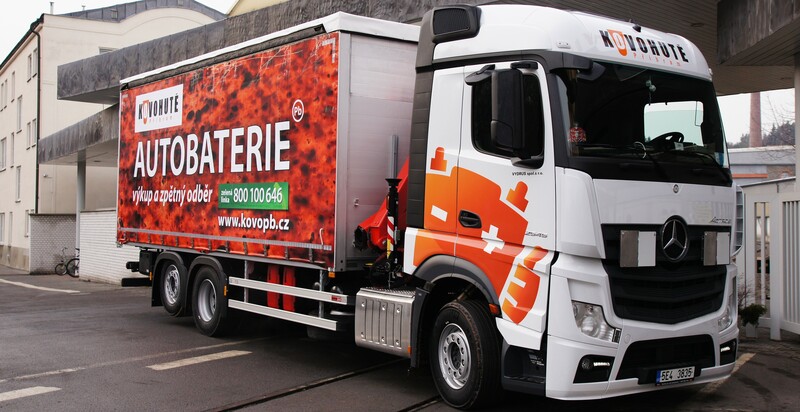 Over the years an extensive network of purchasing stores and collection points across the whole Czech republic has been built and our vehicles provide the buy-up and collection of hazardous waste. Our vehicles comply with EU standards, so we can transport hazardous waste also for our foreign customers. We use specially designed lorries with stainless-steel containers and with all the necessary equipment for hazardous waste transport in compliance with ADR agreement. All our drivers have completed the requisite training and are in possession of Certificate required for drivers who transport hazardous waste in compliance with ADR agreement. Our drivers are professionals with many years of experience. We are able to collect accumulators within 5 days from your call. Our drivers have Registration sheets and Consignment notes, which are filled in during collections. You will also receive confirmation about hazardous waste disposal for your records. If you are interested we can provide your collecting point with appropriate containers for safe storage of discarded accumulators. We are also able to arrange the transport of dangerous cargos or of other hazardous waste. Because of the strict legislation and the regulations for ecological standards we recommend that the exact details be discussed in advance.